Guess?, Inc. GES posted fourth-quarter fiscal 2019 results, wherein both top and bottom lines lagged the Zacks Consensus Estimate. However, both the metrics improved year over year. In addition to this, management provided fiscal 2020 guidance. In fact, it expects to incur a loss in the first quarter of fiscal 2019. Adjusted earnings of 70 cents per share missed the Zacks Consensus Estimate of 76 cents, though it grew 12.9% year over year on the back of favourable currency translation of 3 cents. Net revenues amounted to $837.1 million, which lagged the consensus mark of $840 million. However, the top line improved 5.7% year over year. This marks the company’s tenth straight quarter of year-over-year revenue improvement. On a constant-currency (cc) basis, revenues grew 9.5%. The upside can be attributed to solid sales in the Europe and Asia segments along with sturdy growth in American Wholesale and licensing revenues. These were partly offset by soft revenues in the Americas Retail. Also, adjusted operating margin rose 10 bps to 9.2%, including a 30-bps positive impact from currency rates. This marked the company’s fifth consecutive quarter of adjusted operating margin expansion. Revenues in the Americas Retail segment dipped 0.7% year over year in U.S. dollar, though it rose 0.4% at cc. Further, retail comp sales, including e-commerce, improved 6% in U.S. dollar and 7% at cc, driven by lower promotional activity and improved conversion rates. This marks the fourth successive quarter of positive comps. Operating margin in the segment improved 270 bps to 8.8%, backed by lower markdowns, improved IMUs and higher comps, partially countered by greater store selling costs. Net revenues in the Americas Wholesale segment rallied 19.2% (up 21.9% at cc), backed by robust growth in U.S. department store and specialty business. Operating margin in the segment grew 500 bps to 19%, mainly due to high mark-ups and expense leverages. The Europe segment's revenues advanced 4.1% (up 10% at cc). Store openings, enhanced wholesale revenues and comps growth boosted the region’s performance. Retail comp sales, including e-commerce, remained flat in U.S. dollar, while it grew 6% at cc. However, operating margin declined 480 bps to 11%, due to higher wholesale and distribution costs along with liquidation of old inventory. These were somewhat compensated by expense leverage from enhanced wholesale high mark-ups and lower wholesale markdown. Asia revenues rallied 21.7% (up 25.8% at cc) on the back of improved comps. Retail comp sales, including e-commerce, grew 13% (up 17% at cc), driven by new store openings and an earlier Chinese New Year. Operating margin in the segment declined 480 bps to 3.6%, owing to sale of old inventory and greater markdowns. Licensing revenues ascended 9.9% both in U.S. dollar and at cc. Operating margin contracted 220 bps to 86.8%. This Zacks Rank #2 (Buy) company exited the quarter with cash and cash equivalents of $210.5 million, and long-term debt and capital lease obligations of $35 million. Further, stockholders’ equity was $837.2 million. Net cash used in operating activities during fiscal 2019 amounted to $81.7 million. Additionally, management approved a quarterly cash dividend of 22.5 cents per share payable on Apr 18, 2019, to shareholders of record as of Apr 3, 2019. For first-quarter fiscal 2020, the company anticipates net revenues to rise 2.5-3.5% (up 7-8% at cc). Moreover, it expects operating margin to decline 4-4.5% on a GAAP basis. Foreign currency translation is projected to adversely affect operating margin by 10 bps. The company also anticipates gross margin to improve on higher IMU. Additionally, the company expects loss of 25-29 cents on a GAAP basis. Bottom line is likely to be adversely impacted by almost 1 cent from currency fluctuations. The Zacks Consensus Estimate for fiscal first quarter stands at a loss of 15 cents. During fiscal 2020, net revenues are guided to improve 4-5% (up 5.5-6.5% at cc). Management expects operating margin to grow 4.8-5.3% on a GAAP basis, driven by a 10-bp benefit from foreign currency translation. Gross margin is projected to expand on the back of higher IMUs in Americas and Europe along with reduced logistics and distribution costs in Europe. The bottom line for fiscal year is expected to be $1.09-$1.21 per share on a GAAP basis. Capital expenditure is projected to be $55-$65 million. Also, the company intends to open 30 stores in Europe and 20 in Asia during fiscal 2020. We note that shares of this company have declined 5.2% in a year, against the industry’s growth of 19%. 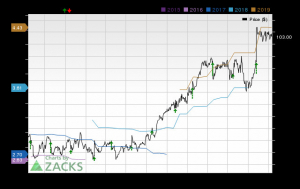 Columbia Sportswear COLM has long-term earnings per share growth rate of 10.9% and a Zacks Rank #1 (Strong Buy). You can see the complete list of today’s Zacks #1 Rank stocks here. lululemon LULU has long-term earnings per share growth rate of 19.3% and a Zacks Rank #2. Ralph Lauren Corp. RL, with long-term earnings per share growth rate of 10.3%, carries a Zacks Rank #2.